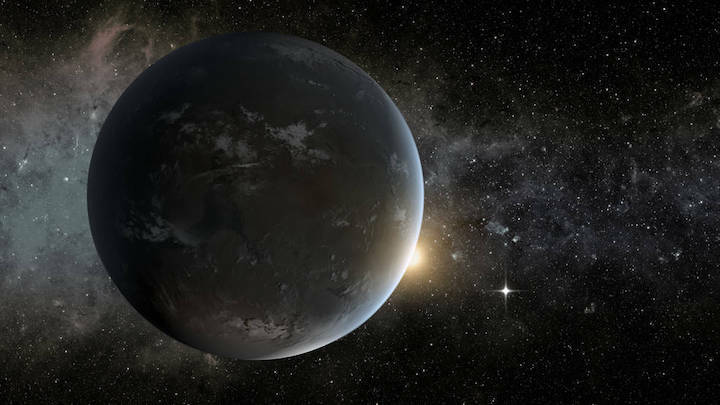 This is an artist's concept of a planet orbiting in the habitable zone of a K star. Scientists looking for signs of life beyond our solar system face major challenges, one of which is that there are hundreds of billions of stars in our galaxy alone to consider. To narrow the search, they must figure out: What kinds of stars are most likely to host habitable planets? A new study finds a particular class of stars called K stars, which are dimmer than the Sun but brighter than the faintest stars, may be particularly promising targets for searching for signs of life. M stars do offer some advantages for in the search for habitable planets. They are the most common star type in the galaxy, comprising about 75 percent of all the stars in the universe. They are also frugal with their fuel, and could shine on for over a trillion years. One example of an M star, TRAPPIST-1, is known to host seven Earth-size rocky planets. But the turbulent youth of M stars presents problems for potential life. Stellar flares – explosive releases of magnetic energy – are much more frequent and energetic from young M stars than young Sun-like stars. M stars are also much brighter when they are young, for up to a billion years after they form, with energy that could boil off oceans on any planets that might someday be in the habitable zone. “I like to think that K stars are in a ‘sweet spot’ between Sun-analog stars and M stars,” said Giada Arney of NASA’s Goddard Space Flight Center in Greenbelt, Maryland. Arney wanted to find out what biosignatures, or signs of life, might look like on a hypothetical planet orbiting a K star. Her analysis is published in the Astrophysical Journal Letters. Scientists consider the simultaneous presence of oxygen and methane in a planet’s atmosphere to be a strong biosignature because these gases like to react with each other, destroying each other. So, if you see them present in an atmosphere together, that implies something is producing them both quickly, quite possibly life, according to Arney. However, because planets around other stars (exoplanets) are so remote, there needs to be significant amounts of oxygen and methane in an exoplanet’s atmosphere for it to be seen by observatories at Earth. Arney’s analysis found that the oxygen-methane biosignature is likely to be stronger around a K star than a Sun-like star. Arney used a computer model that simulates the chemistry and temperature of a planetary atmosphere, and how that atmosphere responds to different host stars. These synthetic atmospheres were then run through a model that simulates the planet’s spectrum to show what it might look like to future telescopes. This stronger oxygen-methane signal has also been predicted for planets around M stars, but their high activity levels might make M stars unable to host habitable worlds. K stars can offer the advantage of a higher probability of simultaneous oxygen-methane detection compared to Sun-like stars without the disadvantages that come along with an M star host. Additionally, exoplanets around K stars will be easier to see than those around Sun-like stars simply because K stars are dimmer. “The Sun is 10 billion times brighter than an Earthlike planet around it, so that’s a lot of light you have to suppress if you want to see an orbiting planet. A K star might be ‘only’ a billion times brighter than an Earth around it,” said Arney. Arney’s research also includes discussion of which of the nearby K stars may be the best targets for future observations. Since we don’t have the ability to travel to planets around other stars due to their enormous distances from us, we are limited to analyzing the light from these planets to search for a signal that life might be present. By separating this light into its component colors, or spectrum, scientists can identify the constituents of a planet’s atmosphere, since different compounds emit and absorb distinct colors of light. “I find that certain nearby K stars like 61 Cyg A/B, Epsilon Indi, Groombridge 1618, and HD 156026 may be particularly good targets for future biosignature searches,” said Arney.